I am a tightwad. If it cannot be homemade, thrift-stored, Craig’s Listed, or simply done-without then I probably don’t bother with it. But sometimes I let my desire for frugality get in the way of my long-term thinking. Cheap doesn’t always mean cost-effective. Cheap food (boxed, highly processed, etc.) can mean future health problems which equals more money. Cheap furniture gets broken more easily. Cheap shoes aren’t great for a kid’s developing feet. And so on. On my nightstand I have a stack of books. The Bible, Spurgeon and The Complete Tightwad Gazette by Amy Dacyczyn. The Complete Tightwad Gazette is a compilation of newsletters titled by the same name and generated from a mom who wanted to live out her dreams but did not have a lot of money to do it with. She couldn’t think of how to make more money so she decided to do more with less money. This book was gifted to me in my early twenties and completely changed my way of doing things. I became a frugal freak. I took it way too far, as a matter of fact, more on that later. Get The Tightwad Gazette on Amazon! Long about that time, I also discovered a mystical place named Ikea. Ikea is cheap and has gorgeous style that I normally couldn’t afford. I am obsessed with very interested in the art of interior design and decor so this place was like Disneyland to me. Cheap furniture with a lot of style, kitchen toys galore, a play place for the kids, and MEATBALLS. I went a little nuts. Every penny of birthday money, can and bottle recycling money, and garage sale money went into this design wonderland and suddenly I had an entire house filled with Ikea finds. Fast forward some years and four boys later and almost ALL of those treasures are, in fact, broken. I have an enormous husband and four boys and my pretty furniture is rotting away in landfills; sad, splintered piles of pressboard. I am now, finally, seeing the error of my thinking. Ikea, I love you, but our love affair is over. Amy Dacyszyn, writer of the Tightwad Gazette, has generated a philosophy based on the premise that the things you consume should be as near to free as possible but the things you use and need should be the best quality you can afford. She and her husband lived off of his military income and had six children. In spite of her lack of resources, she longed to live in a farmhouse with a barn and property. (Me too!!!) So she got out her calculator. In spite of her education in graphic design she found that, once all was said and done, if she got a job and produced a second income for her family she would actually be using nearly all, if not more, of her income toward childcare, gas, work clothes, etc. So she decided not to admit defeat and to think her way around the obstacles in front of her dream for her family. She read all of the books about frugality that she could and found them to be antiquated and extremely boring. That is when she begin a small newsletter called the Tightwad Gazette. It began small and as likeminded people found the newsletter it grew and grew. Eventually the information from the newsletter became so expansive that it was compiled into a rather large book. Her family did not shop for new clothes or buy the most expensive food but they saved and saved until they had enough to buy their home. I took all of her tips and tricks and began to use them in my life but I really failed to incorporate one of her key points: cheap isn’t always inexpensive. When she and her husband wanted to buy a bed for themselves. They saved for a while until they could afford a sturdy, well-made and beautiful antique bed. They paid quite a lot of money for the bed, actually. But they got something well made, so it would last, and beautiful so they would be happy with it long term. They took their time with all of their shopping for furniture and other items and got high quality, extremely well-made things and bought them only once. I so so wish that I had done that! When I think of the way artisans and well-made things are such a rarity in this instant-gratification world, I cringe to think of my impulse buys from Target that lost their value the moment I took them out the door. I want to have a home with things that my children will inherit some day. So today I am starting a little piggy bank for the sofa of my dreams or maybe for that Smeg refrigerator that makes my heart race. I want to re-train my thinking to value a quality item over a cart full of trinkets that will most likely be disassembled and buried in the backyard by my crew. 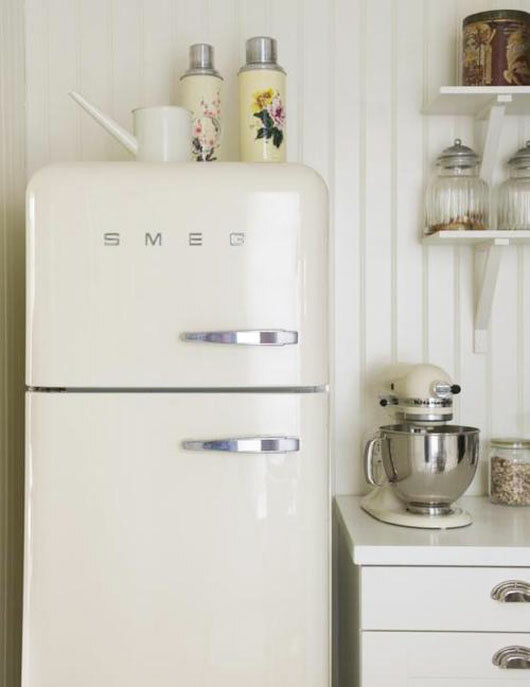 Well, lookie here, Smeg Refrigerator. I could just kiss you, you cute and highly vintage, yet fully-functioning refrigerator of my dreams. I would keep you much cleaner than I keep my current fridge. Scout’s honor. What about you? Learn any frugal lessons? Comment below, let’s start a discussion. Subscribe for updates and zero spam.